MTB Andy includes product reviews, race info and other mountain bike and outdoor related articles. This will be a very cold race. High speeds and freezing temps are expected. I usually have an interior layer of insulation in my helmet, but this plastic will give me some aerodynamics. Like a TT helmet with no forward vents, this plastic will smooth out the windward profile. This is heat moldable plastic that came off my spinach container. I cut the container lid before taking the photos, so this is all that remained. And with a heat gun mold the plastic to the shape of the helmet. I used the heat, then my sleeve to press the hot plastic into the helmet. You end up with this, a clear plastic form of the helmet. Next step for me is to clean the sticker residue. The final step is to secure it to the helmet. I used electrical tape which is able to stretch to the contours of the helmet. With it clean an optional step is to paint the underside. It will appear shiny from the outside. Now I have a more aero helmet that will also keep freezing air from flowing through the hemet. 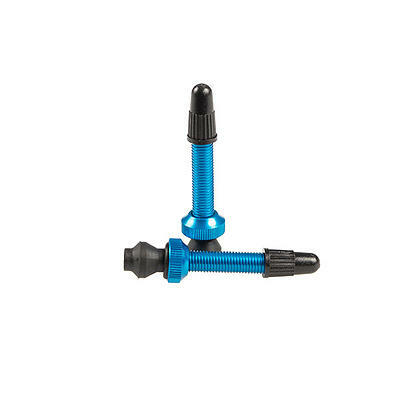 Lightweight tubeless valve stems. 3.8 grams! They feature many colors and have a removable valve core. The rubber end seals against any rim easily, and the raised portion helps keep sealant out of the valve. Pictured here with the other leading brand which is brass. The weight difference is tremendous even for such a small item. To the right you can see how much more volume there is inside the valve stem. Being able to move air fast when attempting to mount and seal a tire is critical. Mounted with the Truckerco Blue rim tape. I ran my valve nut upside down without the O-ring. This way the cone shape of the nut centers into the rim hole and helps make the valve more stable. Valve wobble can be a source of air leaks, and with my double-walled rim there is no need to seal the rim on this end. I have been very happy with my new valve stems. Lighter, with more air flow and they do not need much force to make the seal, so changing a flat (removing the stem) in the woods on a 15 degree day was easy this time. With a true tubeless rim you can use the nut and supplied O-ring to seal the rim airtight from the outside This is pretty standard operating procedure, so no news there. Black, Purple, Gun Metal Gray, Red, Blue, Gold, Green, Orange and Pink. and 60mm in Gun Metal Gray. Speed Evolution’s tubeless aluminum presta valve features a patent pending larger recessed locking O-ring, a larger internal diameter to provide for more airflow and a less plugging caused by tubeless sealant. The vulcanized base includes a raised center so that the sealant does not seep inside and a vulcanized base that is big enough so seal a Shraeder valve and fits almost all rims perfectly. The valve core is removable to easily inflate and add sealant. Speed evolution valves are made from aluminum, about half the weight of brass, and come in cool anodized colors: gold, green, red and pink. They’re perfect accent to a customized bike. These old bottom brackets were not meant to be rebuilt. They last long enough that buying a new one every year or two is not that big of a budget crisis. As this is old technology, and on my beater bike, I decided to revive the bb instead of replacing it. This particular one has a titanium spindle, so would have been a pricey replacement. Using 80 Weight Gear Oil. Add oil to a baggie and let sit for an extended period of time. Spin the bearings to help assist the oil penetration by moving the spindle inside the shell often. This is not as good as axle grease, but you would never get grease inside the bearings using this method. I also use a similar method to oil those suspension bearings that have the metal dust covers. Make sure all the dirt is cleaned off before oiling your bearings to reduce the chance of contamination. 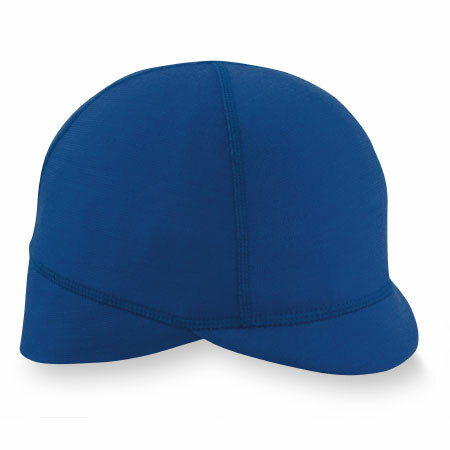 Cool little hat with a brim to be worn under the helmet, or alone in any outdoor activity. 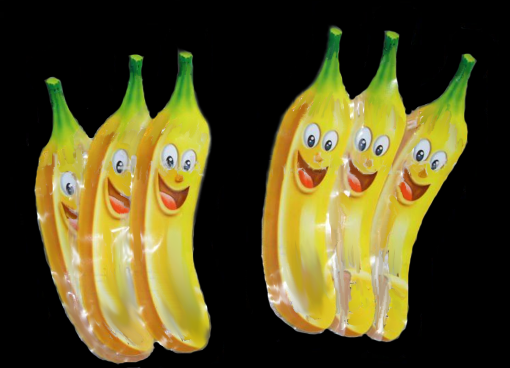 CycleYouth is hosting Speed Banana's Epic Saga, a 4-hour multi-lap timed race. This is shorter than a 6-hour race, but longer than a regular XC event and will provide a full filled day of riding on great trails. The trail system uses all the best single track at the park to offer a fun and rewarding loop for all. Old-timers will remember some of the original trails that are back in use. The loop has been created to maximize singletrack, and offer a true mountain bike experience. The course has been modified from last year's XC version slightly to make multiple laps just a little easier, but all the challenge is still there. The loop is approx 6.8 miles in length and about 90% single track. Parking and start/finish are at the Horse Parking area. For other park users including HORSES and HIKERS the River Side trails will remain open, although the Horse parking lot will be in use by the race. We will run races in heats for 8-11 Kids, Beginner, Sport and Expert (Cat III, II and I), as well as First Timers. First Timer class is just that; first time racing. Kids 8-11 1.6 mile loop using portions of adult loop. Kids 8-11 will start at 8:40AM so racing parents can be there. A big thank you to our series sponsors, for whom we would not be able to bring these events to you. Pro Gold for a fine selection of chain and cleaning products. C Town Bikes for prizes and race support. The course starts in the horse parking area and makes a counter clockwise loop. This map shows all the trails. The heavy lines are the course and the thin lines the unused trails. You will not be able to follow the map unless you are very familiar with the trails. This gps file is accurate, and starts next to the horse parking kiosk. If you have a mapping function on your gps unit then you should be able to follow the race course. At each intersection check the map to see where the trail leads. Sometimes the trail the course uses is not the obvious route of travel. Bar Mitts are a neoprene handle bar cover fitted specifically to your road bike, mtb, or even other sports uses. I have the mtb pair. The idea is to keep all the wind from sucking heat out of your glove, and also insulate your hands in a warm cocoon that allows you to easily operate your controls. Keeping your hands warm on a cold ride makes a huge difference for your over-all comfort. Entry and exit is very easy. My method of entering is to make a pointy-hand by folding my thumb and fingers together. Concerns of missing the hole fold when you realize the Bar Mitts are playable enough to grab on the outside. The Bar Mitts come with an internal hook & loop strap to attach the end to the grip securing the Mitt from moving around (you can see a red flap inside - see below why it is not attached). To attach the Bar Mitt simply unzip the lower cable opening, slide on, and zip up. Two external straps close the opening to reduce air flow. Note that some air flow is necessary to prevent your hands from sweating. The small gaps at the cable provide this. On a sub-20 degree day you can wear 50 degree gloves when using the Bar Mitts. Users report loving using regular gloves as the bulk of winter gloves just does not feel right and isolate the rider from the terrain. I have modified the grip strap by attaching a screw and washer through the Mitt and into the bar plug. It has the same effect, but eliminates the inner strap which can either come off, or in my case, just bug me. Bar Mitts now come with an expandable bar plug to do the same thing, and requires no tools. Where I had screwed the Mitt to the bar plug is the solution. I simply moved the screw hole back 1/2 inch to make more room in front of my hands, and this solved my issue. The larger sizes have a gusset in between the two halves giving them more body/hand room. …I made an Extreme version, its fleece lined, has a removable cuff, a large ventilation zipper and comes with the expandable bar end attachment plug. Warm hands, does not interfere with riding, easy to use, can be left on if temps rise., no more bulky ski gloves. Two new innovations since the initial review are entry slits and a bar plug mounting option. First, is the addition of the slit-entry to the previously tested Bar Mitt. Seen here mounted inside out for visual clarity. The red is the same neoprene fabric as the Bar Mitt, and it is held on with velcro. The purpose is to make a more air tight seal around the wrist to prevent heat loss. The neoprene is just stiff enough to keep the Mitt in a nice oval shape. Entry and exit are quick. Mount this black side out so the velcro does not show, and so it will shed snow or rain better. The new Bar Mitts come stock with the slit-entry. To the right is the Extreme Bar Mitt. The only size is XL. The 5.5 mil neoprene is thicker and lined with a fleece interior for extra warmth. Viewing inside out here shows the bar plug mounted into the red fabric, which is sewn to the inside, so the bar plug remains fully inside the Mitt. To mount the plug a small hole allows a 4mm allen wrench to tighten the expanding plug. It is securely attached when mounted, so removal on the trail will require that 4mm wrench again. Here is the bar plug shipped as an upgrade for older versions of Bar Mitts. The red tab seen above on the Bar Mitts has a hole just big enough for the allen bolt to slide through and is held secure between the rubber thingie and the purple cap. The washer is actually the nut which the bolt threads into. The red tab is big enough to allow the user to reposition the bar plug so as to fine tune position of the Bar Mitts on the bar/brake lever assembly. Not pictured here, but a small detail on new Mitts, is that the zipper unzips from the edge. The significance is that the zipper does not detach at the end when open anymore. Mitts no longer require getting the zipper started as on a jacket, but rather a quick zip like on a jersey. Bar Mitts is a small company with innovation always on their mind. It finally got cold. With highs barely getting above 20 I finally got to test these further. The bigger size of XL made it possible to wear ski gloves, which is nice to wear at these temps. In my size Large the space is just too tight for bulky gloves to fit neatly. I was glad to have the bigger size on cold days. With temps in the high teens my hands were sweating a little. The trick is to open the velcro closure a little to allow some airflow. 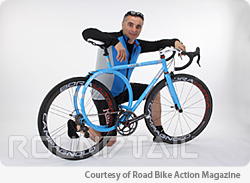 A crazy looking bike, but with purpose. It is fun that the frame circle almost matches the wheels, but there is more to it than ascetics. The giant circle is essentially a leaf spring. The initial reaction to riding it is that no noticeable difference in ride quality is felt. The real benefit is on longer rides when the micro-shock from tiny bumps in the road would normally start to agitate the rider. After about 2-3 hours in the saddle the rider will start to appreciate the comfort of the Roundtail. After the initial ride the effects are noticeable even at the start of a ride. It does have a small suspension effect. The rider notices bumps that are usually uncomfortable are now much smoother. Test riders noted that they were looking for instead of avoiding bumps just to feel the action of the frame. The frame is designe on CAD where finite element analysis can be studied. The frame not only smooths out the bumps, but dampens the high frequency vibrations, the ones that can feel like holding a power sander. Durability of the frame is improved since strain is transferred around the circle and not on any one specific point as a triangle would have. Frame testing beats it up with 100,000 cycles, and the Roundtail surpasses a traditional frame. I got the chance to ride this bike for a few days. I had mixed feelings about it. While it does ride very nicely, there are those shortcomings that I cannot do without personally. The biggie is that the 2nd bottle cage mount on the would-be seat tube is missing, leaving only one mount, thus one bottle. The next, and much lesser, is that there is extra material in making the rear round, so there is a weight trade off for your comfort ride. This really is not a problem for the intended end user who does not intend to enter competitive racing. I like the frame and the ride quality, but coming from a mountain bike background I feel that smoothing out road bumps pales in comparison to what happens off road. A much better application of this technology would be in a hard-tail mountain bike frame where there is a greater need for smoothing out the bumps. It's not for me. I need two bottles on my road rides, and am not willing to give that up for creature comforts, but if you are looking for a cool frame that rides excellent, the Roundtail might be for you. 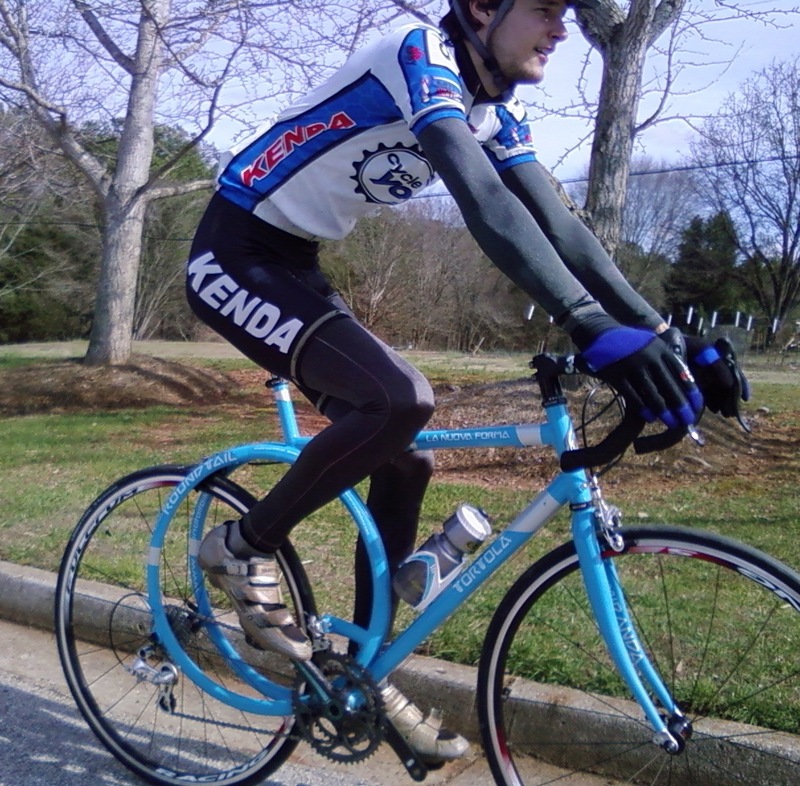 Andy is one of the most accomplished cyclists in the Atlanta area, with a career spanning over 20 years and having three mtb National Champion titles under his belt. As a pro cyclist and a very successful coach for CycleYouth, Andy is constantly on a lookout for the newest products, allowing better performance, functionality and convenience. Andy is like that friend who has that product already and you can ask him about it (or just read his blog). I review products that I would want to use and am already interested in. I do my best to test/use the product as it was intended to be used and for what it was designed for. At times I will use it exclusively for what I intend to do with it and might mention that in the review, but keep the review to the products intended application. Products will be tested in the environment and conditions applicable (I will not test a water proof bivy sack in a cave, or a downhill bike on an xc trail). I communicate with the product manufacturer when needed to verify product details. If a product is found to be defective then a new one will be substituted for review. If a product is terrible, then I will not waste your time with it. I hope my reviews are helpful, and feel free to comment or ask me questions about the product as many products I continue to use.